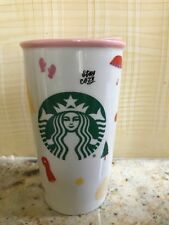 2018 New Starbucks + Ban.Do Double Wall Ceramic Tumbler 12 oz Now In the USA! New ListingBan.do See You At The Pool Turquoise Koozie Can Bottoms Up! ban.do Pink The Getaway Passport Bag Luggage Tag Holder "Here comes the fun"